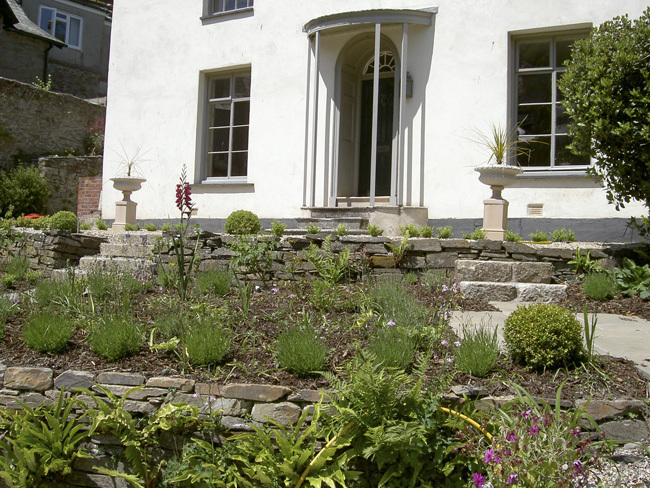 The redesign of the garden in front of an historic house in the seaside town of Looe. 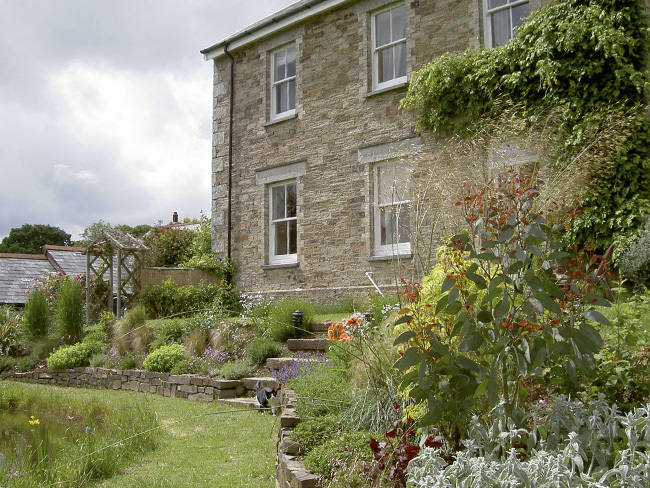 The existing garden was not in keeping with the period and grandness of the grade II listed house. 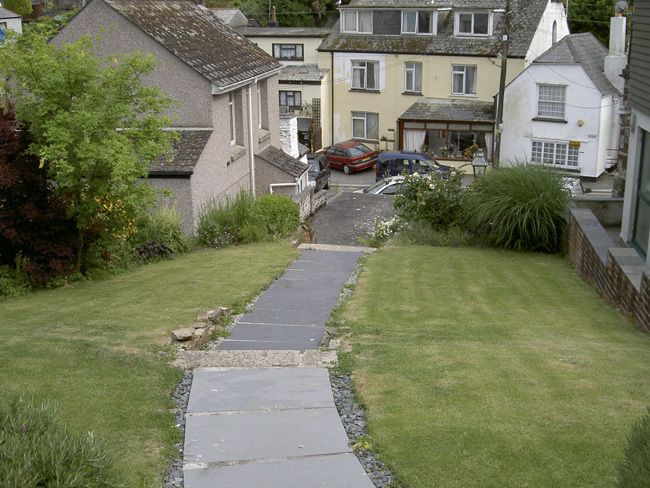 It was steeply sloping and consisted of overgrown borders, poor quality lawns with a smooth slate path running up through the centre. The steep path was dangerous when wet and dry. 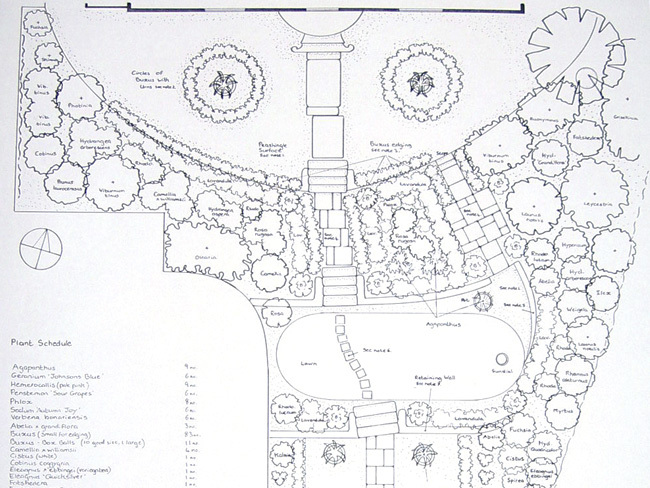 The new garden design had to reflect the historic significance and setting of the 17th century house. It had to include useable seating areas with safe access throughout. 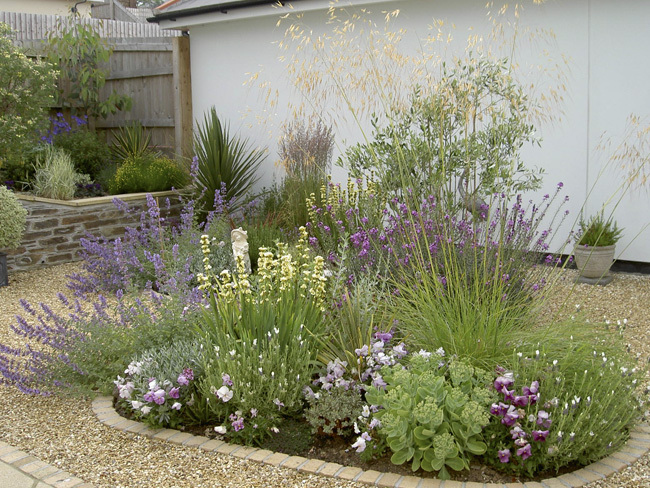 The plants chosen had to thrive in a coastal environment providing interest all year round. 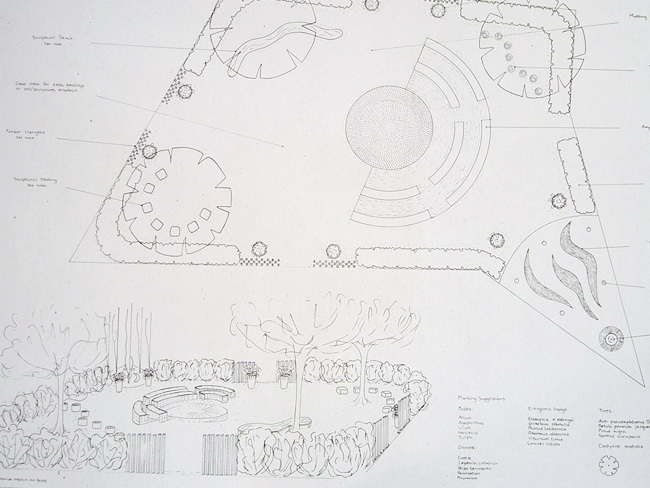 The materials and plants used were chosen to reflect those used in Georgian gardens. 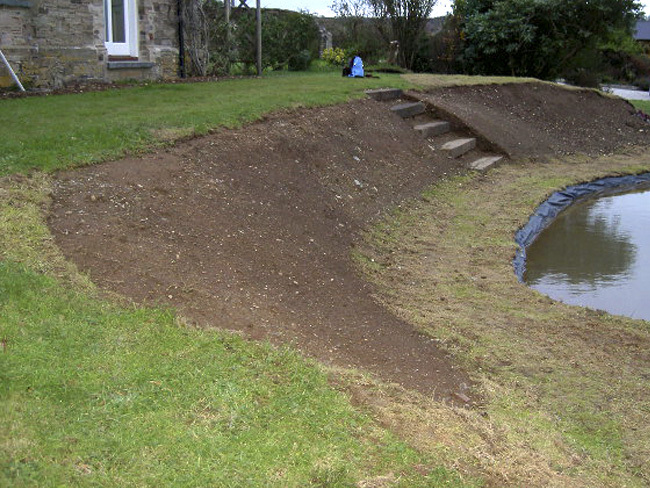 New levels were created out of the slope to provide a gravelled entrance garden, and oval lawn. Box was used as border edging and to create small circular hedges encircling planted urns and pedestals. 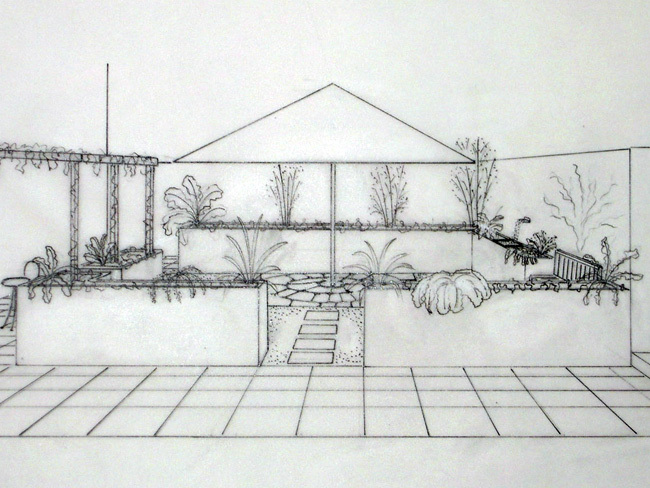 A design for a small courtyard garden of a newly built bungalow in Wadebridge. 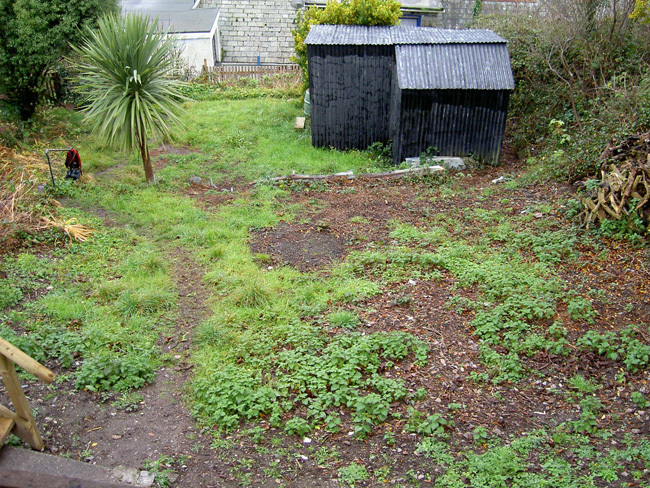 The small square garden had just a patch of lawn and is bounded on four sides by a high fence and three walls. 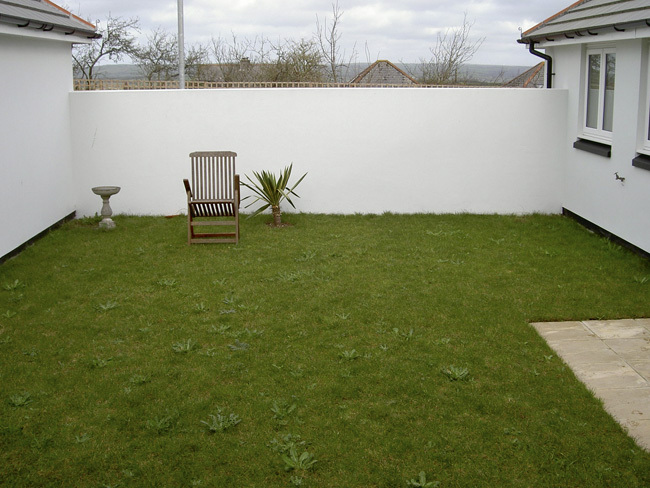 Two walls had to be left free of any planting or structures and with access for maintenance, as one is the wall of a neighbouring house and the other a wall of the client’s own bungalow. 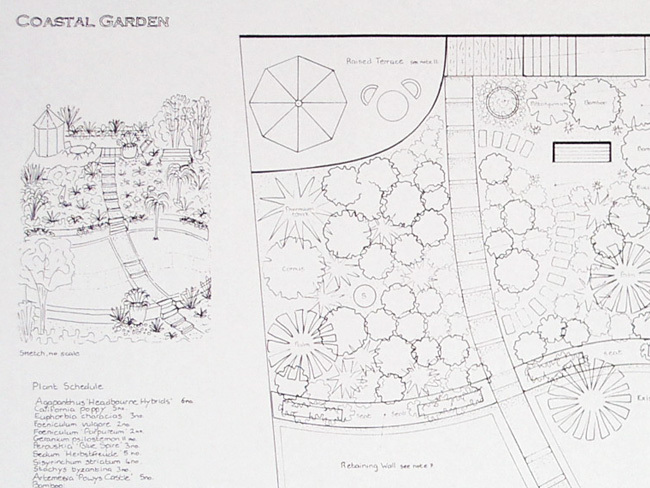 The retired client wanted a design to reflect the style and planting of a sunny Mediterranean courtyard, with easily accessible seating areas and without any lawn to mow. 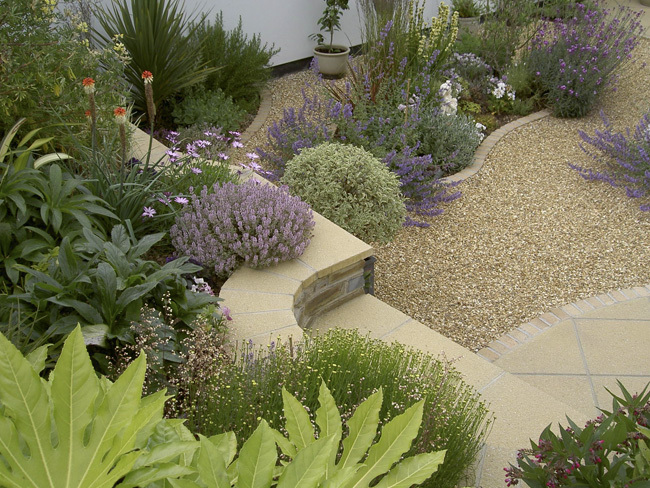 By using curving lines and small pavers laid on the diagonal we created a softer and more spacious feel. The paved areas curve around the garden allowing the client to move his seating position throughout the day to follow the sun. 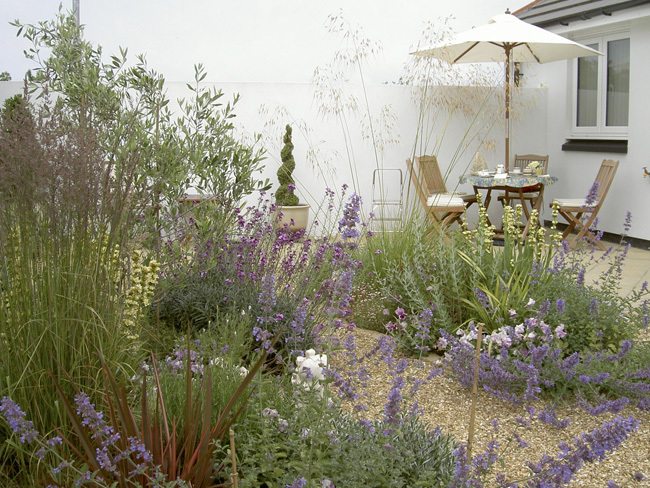 Curving beds filled with an Olive tree and sun loving plants are positioned centrally, so the client can look out across the borders wherever he sits. 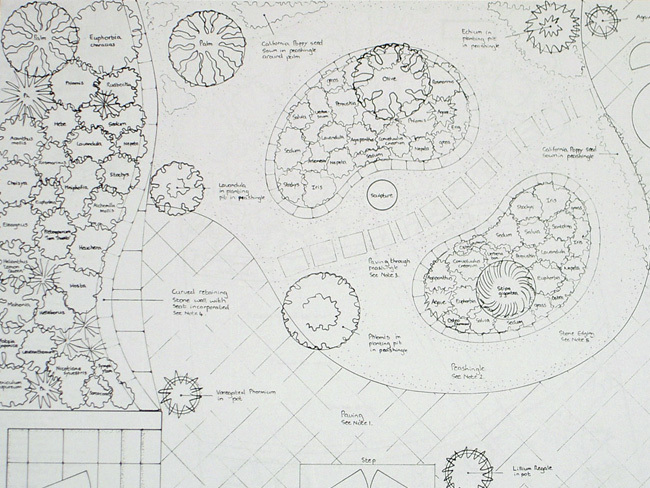 A design to reclaim a neglected and unusable plot of land and incorporate it into the rest of this coastal garden. 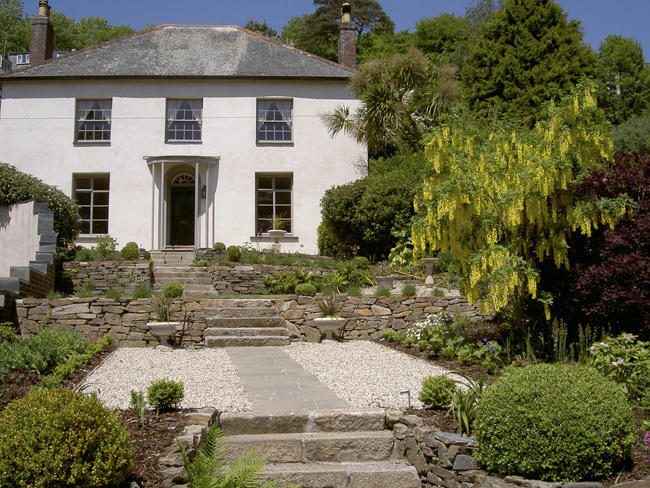 This garden faces the sea and is split into several sections, sloping steeply away from the house. 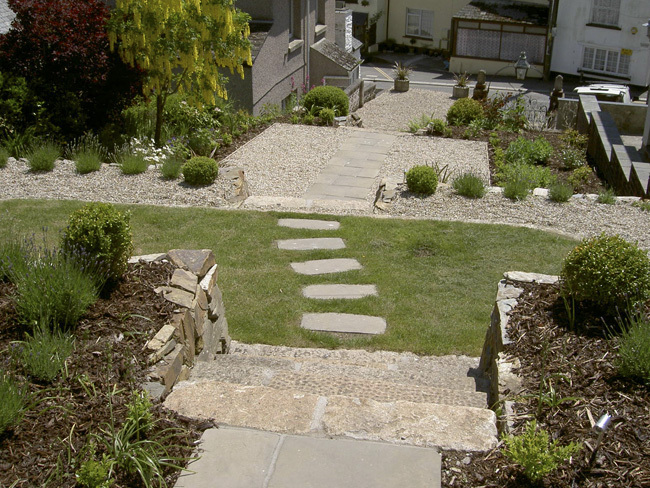 The brief was for a modern design to transform the neglected and derelict bottom third of the garden, with spaces for seating, a lawned area for lying in the sun, and easy access up and down the steep slope. 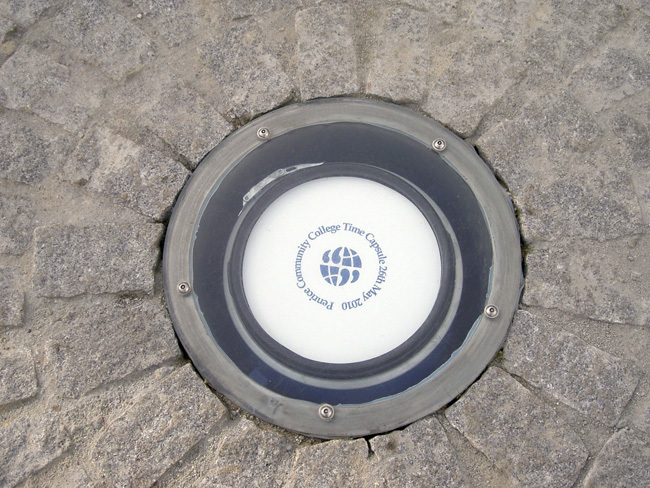 The design creates three different usable levels. 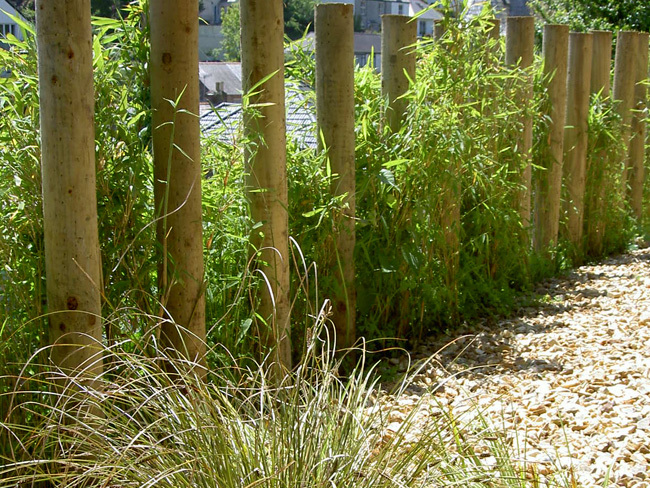 Firstly a low maintenance gravelled entrance area with ornamental grasses and bamboo as a boundary screen. 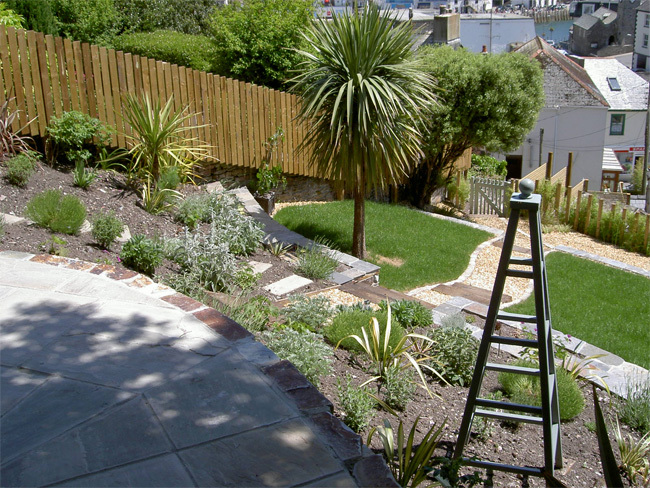 Above is a fine lawn outlined in gently curving lines, and above this a sloping bank with plants that will thrive in a seaside location. 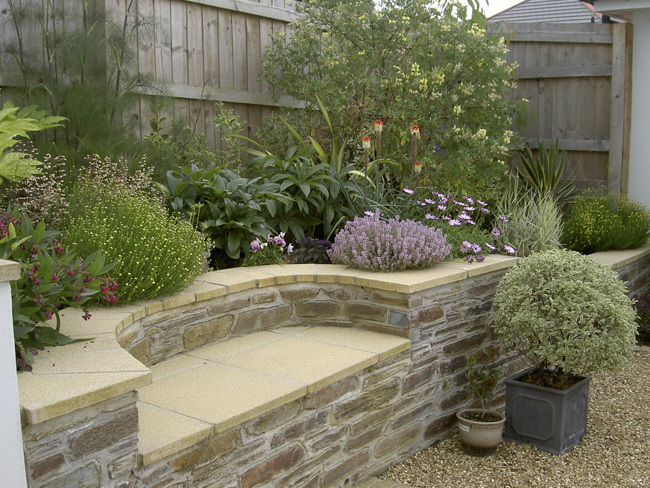 The retaining walls also act as planters for succulants, as well as providing seating. 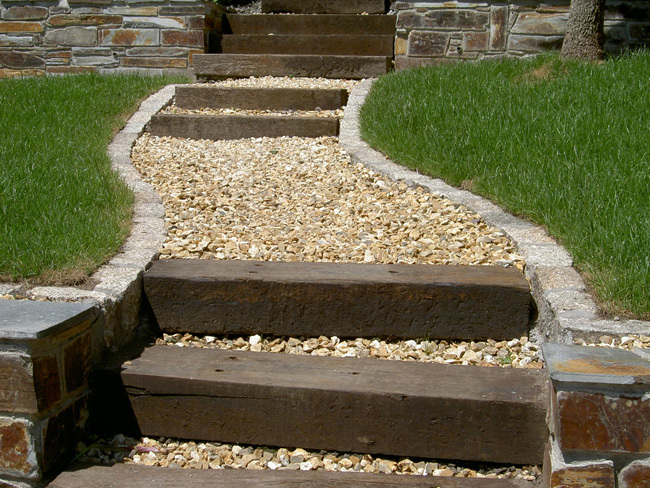 A path with deep shallow steps winds down and through each level, quickly linking the top of the garden to the bottom. 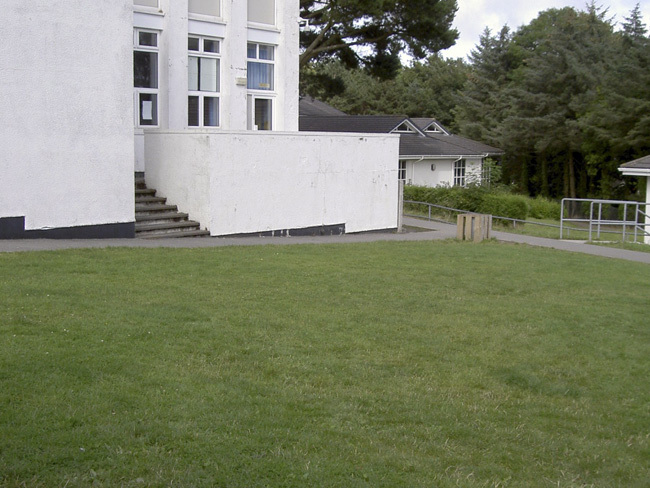 A design to transform a large courtyard area, which was wasted space between school buildings, into something more useable and exciting for the school. 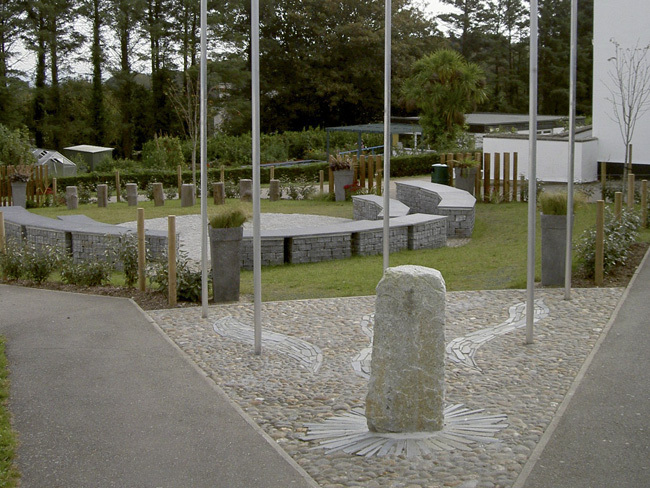 The Headteacher and pupils wanted a design to commemorate the 50th anniversary of the school, that could be used for outdoor educational activities and performances. The space was rough grass, muddy in winter and baked dry in the summer. The design had to take into account the requirements of both the Headteacher and the pupils with space for seating. Above all it had to be hard wearing and reflect its Cornish setting. 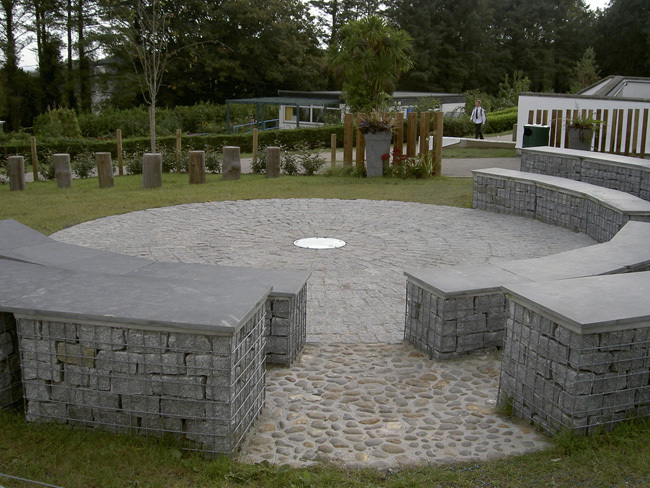 A mini amphitheatre for outdoor learning and performance was designed with seating created from wire cages filled with granite setts and topped with slate. 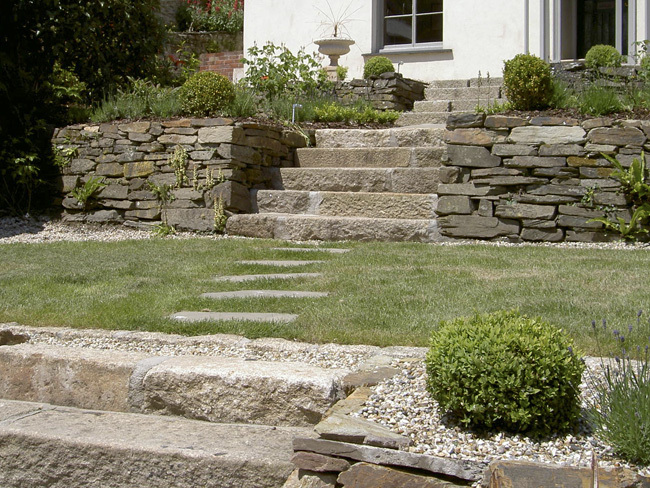 Local granite, pebbles and slate pieces have been used decoratively and in the hard surfaces. Squares of granite and smooth tree logs have been set in the ground to create extra seating areas. An evergreen hedge encloses the space and softens the hard materials. 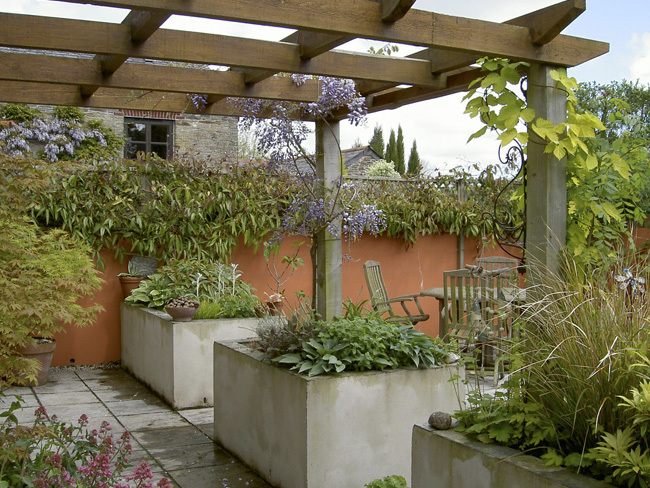 Tall planters filled with bulbs and grasses provide colour and plant interest. 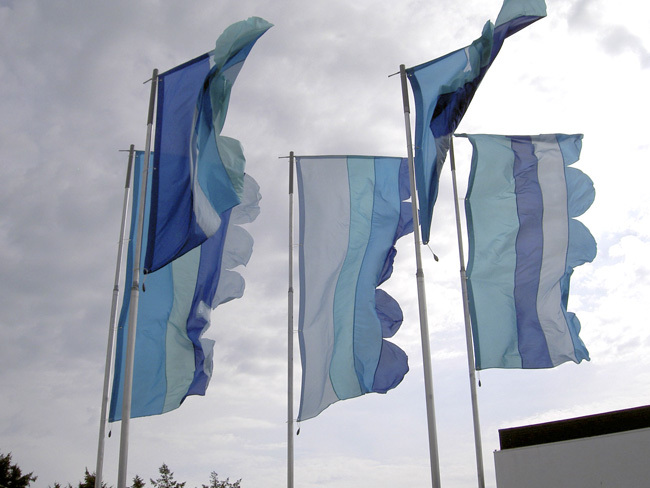 To celebrate the five decades of the life of the school there are five flagpoles with locally made and designed banners atop. 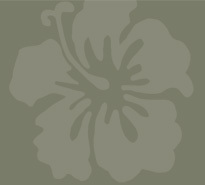 The creation of a design for a plant lovers garden in an exposed open field behind a renovated barn. The land behind the barn is on two different levels. 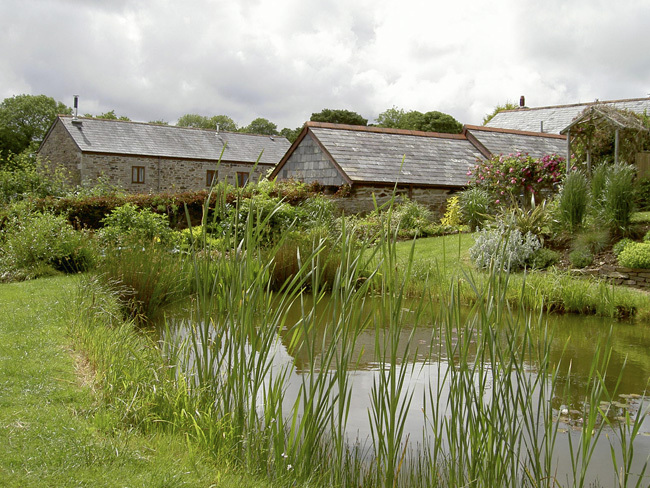 The space closest to and on a level with the barn has had all the top soil excavated during the building works. 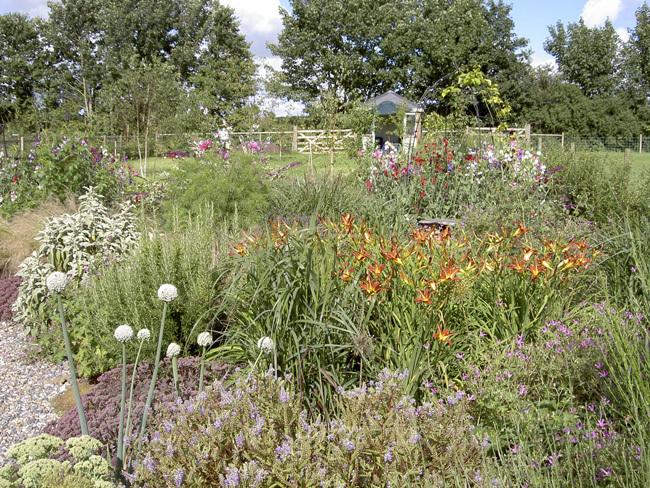 The rest of the garden is at a much higher level and is exposed but does have good topsoil for planting. 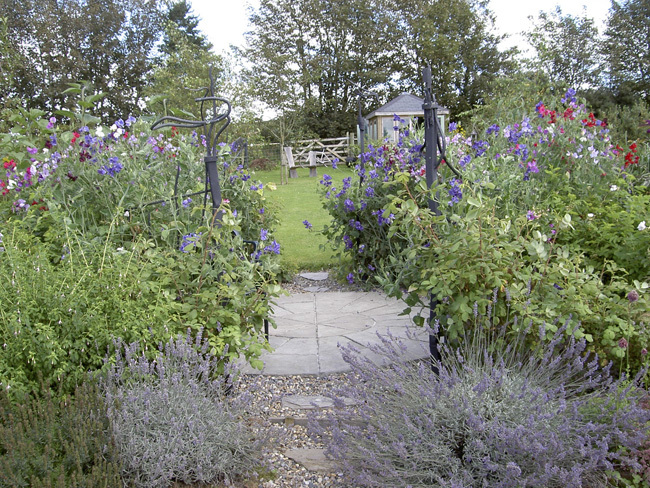 A courtyard garden with a Wisteria pergola and raised beds has been created for the excavated area behind the barn. 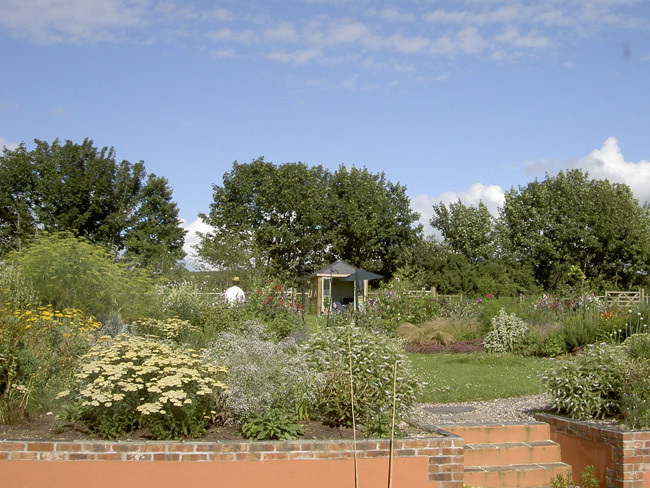 The higher garden is divided into a plant lovers garden with deep borders filled with a wide range of flowers, bulbs and shrubs, all surrounding a central private seating area. A more open and natural lawned area lies beyond with trees, spring bulbs a living willow screen and summerhouse. An evergreen hedge encloses and shelters the whole garden. 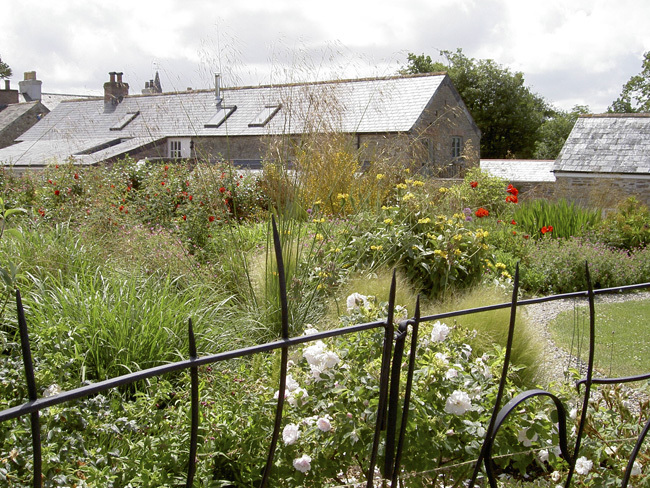 This design creates a garden for a house looking out across fields. 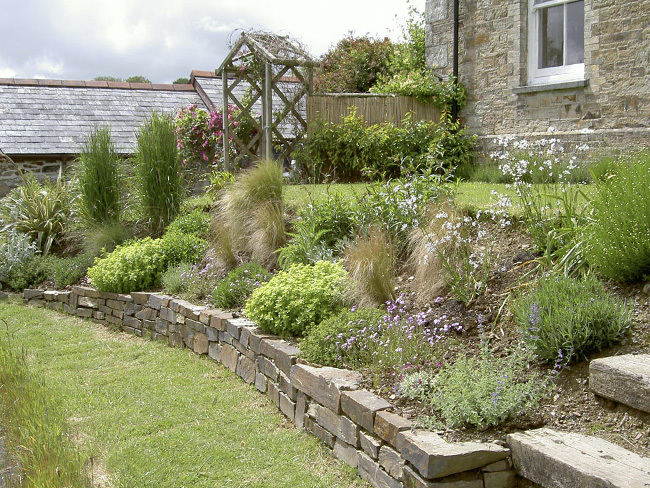 It transforms the steep grass slope running down from the house with soft planting, levels, grass paths and a wildlife pond. 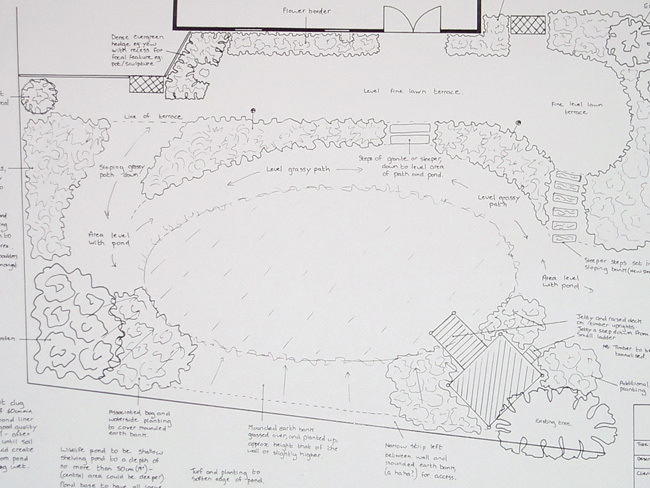 The main brief for the design was to create a level area for a shallow wildlife pond, one that would be in keeping with the surrounding landscape. 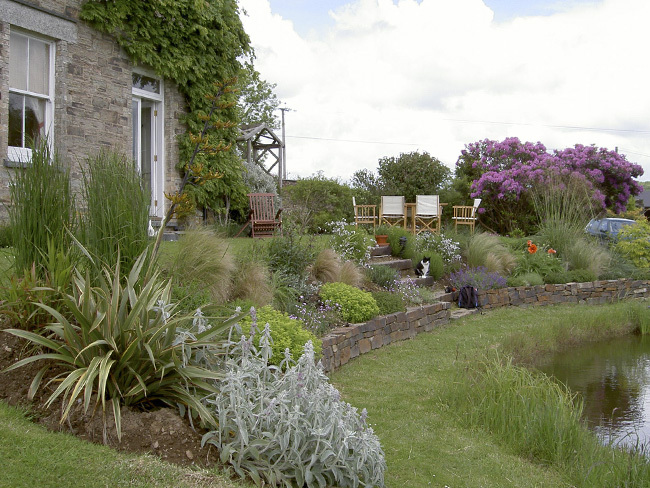 The view out across the fields from the house and garden is not interrupted with planting and acts as a backdrop to the pond and garden. 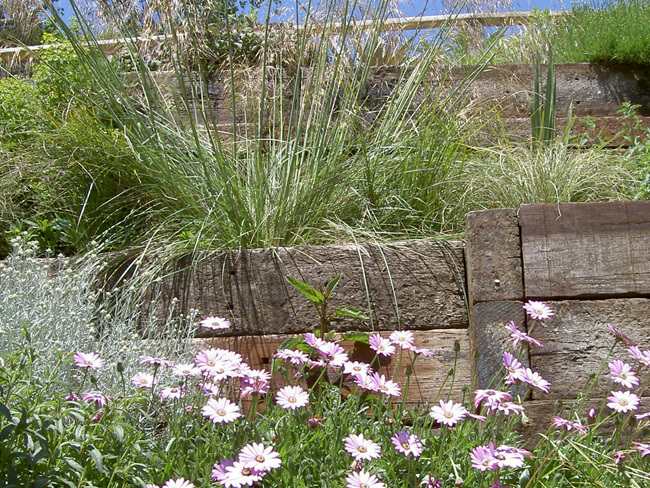 A new bank has been created and planted in a natural style with sun loving perennials and grasses to give colour and movement. Grassy paths wind around the pond and some existing flowering shrubs have been left in place to give the garden a feeling of maturity.